At Reiter & Walsh ABC Law Centers, one of the things clients commonly say is that it can be difficult to find resources and support for their child with disabilities, especially in situations where the child was just recently diagnosed or if the child is older. Our firm hopes to help parents find the information they need to be secure knowing their child will be cared for properly, no matter what. In order to help families commence their search for cerebral palsy resources in Wisconsin, we’ve collected a short list of potentially useful information sources, including basic cerebral palsy information, legal and financial assistance information, education and early intervention resources, and other reference websites. How do I get financial or medical help for my child with cerebral palsy in Wisconsin? How can I get my child educational help or early intervention in Wisconsin? Where can I find employment resources for individuals with cerebral palsy in Wisconsin? Ataxic cerebral palsy: Characterized by difficulties with coordination and balance, as well as hypotonia and tremors. Dyskinetic cerebral palsy: Characterized by muscle tone that fluctuates between limp and tight. Divided into two different subcategories: athetoid and dystonic cerebral palsy. Athetoid cerebral palsy is characterized by limp muscles during sleep and/or involuntary jerking or writhing movements during wakefulness. Dystonic cerebral palsy is characterized by a stiff body and head position. About 60% of 8-year-old children with CP have another developmental disability of some type. Almost 25% of children with CP have both intellectual disabilities and epilepsy. The underlying brain injury that causes cerebral palsy can stem from numerous sources. In many cases, cerebral palsy is related to medical malpractice, a situation where a medical practitioner makes an error that results in a patient’s injury. Because babies’ brains are so fragile, medical errors can result in devastating and permanent lifelong injuries. While the following list is not comprehensive, it does include some of the most common medical malpractice-related causes of brain injury. If your loved one was diagnosed with one of the following conditions or remember a concerning situation that occurred during birth, labor and delivery, it may be worthwhile to have a birth injury attorney go through the medical records to understand what happened during your child’s birth. Cerebral palsy caused by medical malpractice is preventable. Much of the prevention effort is focused on preventing the environmental and procedural conditions that caused the medical error in the first place. This means ensuring that medical practitioners are following standards of care when providing services to their patients, whether these standards are related to developing and implementing specifically established protocols, clear communication between staffers, or the development of accountable medical systems that can proactively investigate reports of medical error. 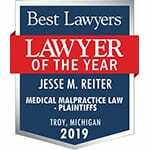 If you experienced a difficult or concerning birth, and your child is showing signs of developmental delays or disabilities such as cerebral palsy, the first step in securing justice and care for your child is speaking to the Wisconsin birth injury attorneys at Reiter & Walsh ABC Law Centers. Reiter & Walsh ABC Law Centers is unique in that it focuses only on birth injury, working to obtain justice and security for children with birth-related injuries. Unlike other personal injury firms that can split their time between handling nursing home, product liability, and medical malpractice cases, we focus solely and exclusively on birth injury, providing us with the necessary knowledge to litigate these medically and legally complex cases. Our success is evidenced by our long list of multimillion-dollar verdicts and settlements and awards. Please feel free to reach out to us 24/7 for a free and confidential case evaluation. If you decide you would like to seek legal options to secure your child’s future care, we can go over the options available to you. The resources available to families of children with cerebral palsy can vary significantly depending on their geographic location, resource constraints, and regional differences in bureaucratic approval and screening processes. While the following list is not comprehensive, the birth injury attorneys at ABC Law Centers hope the below resources will be useful as starting points for further cerebral palsy research. Because these larger national organizations provide such a wide range of services, we do not list them individually in the below headings. In addition to these nonprofit organizations, a great way to find local resources is to contact local city, state or regional Departments of Human Services, Community Program, Social Service, and Human Service Agencies, Departments of Children and Families, or Departments of Health Services, which have specially-trained staff who can assist individuals with referrals, tracking down information, and obtaining assistance. The Wisconsin Disability Determination Bureau (DDB) determines the eligibility of individuals with disabilities in applying for Social Security Disability Insurance (SSDI) and Social Security Income (SSI), as well as Medicaid. The Wisconsin Department of Health Services also provides resources for independent living and assistive technology equipment loans, services for the families of individuals with disabilities under age 21, as well as information on employment initiatives and physical disabilities. The Milwaukee County Disabilities Services Division oversees the Disability Resource Center, which provides information and access to disability benefits specialists. Benefits.gov provides a quick reference list of all public assistance programs available in the state of Wisconsin, including employment, nutrition, education and health insurance assistance. The ADA Wisconsin Partnership in Madison, Wisconsin provides information, technical assistance and training on the Americans with Disabilities Act. The Wisconsin Department of Transportation provides assistance with transit for individuals with disabilities. There is a wide variety of service providers – whether they are large children’s hospitals or dedicated rehabilitative clinics – that provide children with disabilities with therapy, speech-language pathology, adaptive equipment loans and other needed services. There are also several state-run insurance programs that can help defray the cost of specialized medical care. The Children’s Hospital of Wisconsin Pediatric Rehabilitation Medicine Department and Child Development Center provide comprehensive medical and supportive care for children with disabilities. The Medical College of Wisconsin’s Spasticity Management Program in Milwaukee helps individuals with cerebral palsy manage their spastic symptoms. Medical homes exemplify a comprehensive approach to managing a child’s healthcare; Chippewa County offers a listing of resources for medical home planning and other resources to maximize a child’s developmental abilities. Cities served include Chippewa Falls, Bloomer, Cadott, Cornell, and Stanley. The Wisconsin Assistive Technology Program (WisTech) in Menomonie, WI provides assistive devices and durable equipment to individuals with special needs. Wisconsin has numerous organizations devoted to assisting individuals with disabilities in living fulfilled and thriving lives. These organizations can provide enrichment, informational and recreational resources and programs that range from child care to residential care for seniors with disabilities. These organizations are often, though not always, part of a robust network of specialty service providers, and can often be a great resource for parents seeking specialized services. The Wisconsin Board of People with Developmental Disabilities (WBPDD) provides opportunities for individuals with developmental disabilities to attain employment, higher education and self-advocacy. Disability Rights Wisconsin helps people across Wisconsin gain access to services and opportunity through its advocacy and legal expertise. Community Advocates helps connect individuals in need with resources that can help them. This includes healthcare assistance, as well as help with housing and utilities, SSI, and homelessness. Community Shares of Wisconsin is a network of over 60 nonprofit organizations, including several that focus specifically on providing services to individuals with disabilities. Early intervention programs are designed to help young children maximize their potential as they grow through the critical developmental period of birth through three years. Other programs focus on other stages of life, including school age or adulthood; these programs are specifically designed to prepare individuals for living as independently as possible within their capabilities. Some service providers focus on assisting only a single age group (such as very young children), while others provide multiple programs for each stage of life. It is useful to contact each service provider individually to see if they have a program that will accommodate your child’s specific needs, whether they are infants or full-grown adults. Early Intervention programs (for children ages 0-3) are designed to help children at risk of developmental delays or with diagnosed developmental delays. Children enrolled in Early Intervention programs have an Individualized Family Service Plan (IFSP), which helps them transition into the school environment. Wisconsin Child Find is the first step in securing specialized planning for a child with disabilities. The network evaluates child development and begins the process of gathering resources tailored to your child’s specific needs. The Wisconsin Department of Public Instruction also provides parents with resource information and parental informational tools and agency listings. The Wisconsin Birth to 3 Program provides early intervention services for young children, no matter where they are in Wisconsin. The program operates regional and local offices across the state. The Wisconsin RtI program provides evidence-based methods for screening and identifying children who may need additional intervention. The Wisconsin Education Services Program for the Deaf and Hard of Hearing (WESP-DHH) provide services to individuals who are deaf, hard of hearing, or deafblind. WI FACETS (Wisconsin Family Assistance Center for Education, Training and Support) in Milwaukee, Wisconsin provides information and referral, individual assistance, support groups, parent leadership development, workshops and events for individuals who care for children with disabilities. The Wisconsin Head Start Association provides early education opportunities for all children, including those with disabilities. Once a child turns 3, they are enrolled in a program that develops an Individualized Education Plan (IEP) for them. This plan, developed in conjunction with professionals at the child’s school, focuses on helping the child succeed academically. Because IEPs are developed in conjunction with the child’s school, parents should speak to their local school district’s special needs program staff as well as the special needs program administrators at the child’s individual school. Once a child turns 16, their IEP must be amended to include a postsecondary transition plan, also developed in conjunction with the child’s IEP team. The Wisconsin Special Education Mediation System (WSEMS) provides neutral, third-party facilitators that can help parents develop IEPs for their children. Depending on the severity of disability, individuals may be enrolled in several different programs once their schooling is completed. Some individuals go on to complete higher education; these students are often supported by the Office of Disabilities at their place of learning. If they pursue employment, ‘supported employment’ and ‘supported living’ programs are available to assist with aspects of independent living that may be more difficult (as described below). Those with severe disabilities may be enrolled in day programs or residential communities, though options vary depending on region and funding availability. Where can I find employment or housing resources for individuals with cerebral palsy in Wisconsin? Regional Enterprises for Adults and Children, Inc. (REACH, Inc.) provides opportunities for people with disabilities to promote self-determination and full participation in the community, regardless of their ability. These include supported employment options, day services, programs for children with developmental delays, and childcare services. REM Wisconsin provides services to children and adults with disabilities and/or brain injuries, including residential services, day and vocational programs, and rehabilitation programs. The Wisconsin Employment First Initiative helps individuals with disabilities seek and secure gainful employment. The Transition Improvement Grant website provides information about helping individuals transition between schooling and employment, especially focusing on young people. The organization has branches in Madison, Whitewater, Chippewa Falls, Green Bay, Pewaukee, Fennimore, West Salem, Portage, and Tomahawk, Wisconsin. Family Voices of Wisconsin provides a PDF resource guide for housing for young adults with disabilities, as well as resources on the transition from schooling to adulthood. The Wisconsin Department of Administration’s Division of Housing provides a Household Housing Guide. This guide contains several organizations that assist individuals with disabilities. Easily find disabilities-related groups by using the ‘Find’ function (Ctrl+ F) and searching ‘disability’ or ‘disabilities’. Genesis Housing in Oregon, WI provides housing for elderly individuals and individuals with disabilities. There are several options open to individuals with significant disabilities in terms of community-based long-term support, including Family Care and Community Integration. TLC Homes provides disability-related housing for individuals in the Lakeshore area. The Waisman Center of Madison, Wisconsin provides information on transitional resources for young adults with disabilities. The Learning Disabilities Association of Wisconsin provides a listing of testing facilities if parents suspect a child has a learning disability. VPI of Appleton, WI provide employment and community-based support initiative to individuals with disabilities, including early intervention programs. The Wisconsin Adaptive Sports Association gets children with disabilities participate in fun recreational initiatives, including rugby, hockey, basketball, lacrosse, and tennis, among others. The Special Needs Resource Project maintains a database of special needs resources, ranging from employment to health insurance to military benefits assistance. YAI, an advocacy, group, provides a listing of Wisconsin-specific local resources for individuals with disabilities.